Recently, I jumped on the bone broth wagon. Whilst going through difficult emotions in my personal life this winter, I had an intense craving for broth. The warm, fatty, nutrient dense liquid commonly associated with colds or the flu, became a daily routine. Few scientific studies have focused on bone broth. The evidence is lacking as to whether bone broth is a reliable treatment for any particular disease. Many people claim that bone broth will heal digestive and gut issues – as well as ailments connected to gut health, such as depression. It is also said to be anti-inflammatory. Campbell-McBride developed a diet around bone broth called GAPS, short for gut and psychology syndrome1. In fact, I found an article warning about lead contamination in bone broth since bones store heavy metals such as lead1. While bone broth is a popularized trend that includes broth bars in New York City and its use as a staple in the Paleo diet, it is an old tradition spanning across many cultures around the globe1,2. Notably, bone broth is hailed as part of the Ayurvedic tradition. Ayurveda is a medical system that evolved in ancient India3. A friend of mine studied this system with an Ayurvedic teacher and told me about bone broth, which put it on my radar and subsequently onto my table. In the past, I made vegetarian broth with vegetables, dried mushrooms, and even (organic) banana peels. 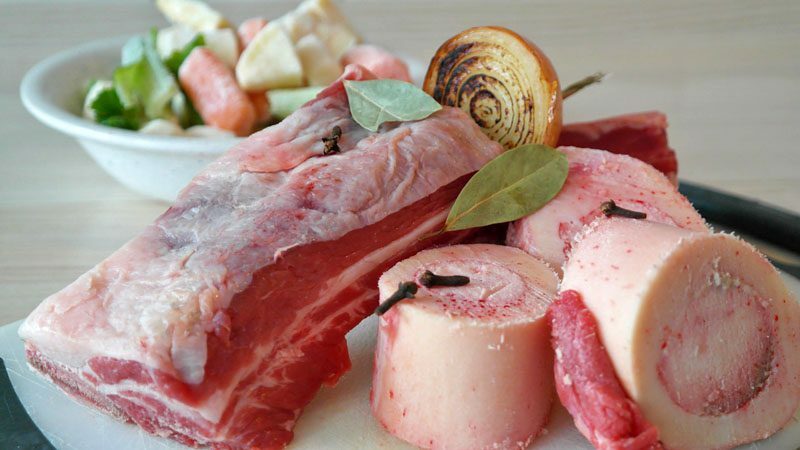 Now, I use beef bones (from organic, grass-fed beef) – other recipes include chicken or fish bones – along with vegetables (carrots, onions, garlic, celery, turnips, kale stems, fresh herbs like nettles or rosemary, dried mushrooms, and other organic vegetable scraps). Also, for added minerals, Dr. Mercola suggests adding parsley toward the end of the cooking process4. The broth contains a thick layer of fat and is collagenous. A cup or two of broth can be a substantial snack, breakfast, or addition to lunch/dinner. At first, the taste can be strong but adding salt and/or a little bit of miso paste will make it palatable. use a crockpot so the broth can simmer even while you are not home. The broth may be kept in the refrigerator for up to one week or in the freezer for longer. Despite the lack of scientific evidence that it treats or cures disease, it undoubtedly delivers nutrients and minerals to the body4. To me, it warms the digestive system. And, it just feels good. Flora, G., Gupta, D., & Tiwari, A. (2012). Toxicity of lead: a review with recent updates. Interdisciplinary toxicology, 5(2), 47-58. Narayanaswamy, V. (1981). Origin and development of Ayurveda:(a brief history). Ancient science of life, 1(1), 1. Liane (@TheWeeklyApothecary) is a graduate of Warren Wilson College in North Carolina where she studied Biology with a focus in Botany. Prior to her formal education, she had years of experience working with plants through both urban gardening and rural organic farming. She continued to work in greenhouse maintenance through her time at Warren Wilson. As a plant enthusiast, she is self-taught, mentor lead, and workshop learned in the realm of herbalism. The Weekly Apothecary, blog and signature tea blends, is a part of Liane’s work with plants. She continues to work with the healing properties of plants and to live the herbalist lifestyle in her own life and within her community of family and friends. Currently, Liane is a graduate student in Public Health to learn more about engaging communities is healthy behaviors and wellness.